Plot synopsis: A pair of record collectors is interviewed about their collections, with their preference for older, 'classical' popular music causing them to be caustically dismissive of more modern recordings. Review: At first, I did not realize that this episode was meant to be satirical, believing that it was a genuine interview with two record collectors. However, the absurdity of the two men's comments soon reveals that this is indeed a sly, mockumentary-style satire. Impressively, too - given that it is over half a century old - it remains genuinely funny. For example, the bizarre profession of one of the pair is revealed to be creating 'monsters' by stitching together body parts of different animals, in the hope that when appearing in parades these will prove frightening to children! The episode also reveals that there is nothing new about music snobbery, with the belief that the pop music of the past is vastly superior to that of the present - which we probably all tend to feel as we grow older - is a perennial one (the truth of this is made particularly apparent by the fact that, in this case, the 'present' being scorned for being too modern is the 1950s!) To lend proceedings verisimilitude, the episode features appearances by real-life performers Margaret Young and Margaret Whiting, the latter of whom even contributes a song. A fun, enjoyable episode. Plot synopsis: An investigation, using dramatized case studies, into various forms of psychic phenomena, including water dowsing, clairvoyance and precognition. Review: Opinions on this episode will likely polarize based on whether or not you believe in psychic phenomena. As a sceptic, nothing in the episode changed my mind about the notion that people may possess special powers that defy rational explanation, and the arguments presented are not especially strong - everything is based on anecdotal evidence, making it all quite flimsy (and just because some of the case studies involve famous figures like Mark Twain doesn't automatically make them more credible). In truth, apparent cases of psychic abilities are normally examples of either deception or delusion, and much can be explained by the fact that most people don't properly understand the rules of probability (of course some 'psychic' predictions will come true!) and the all-but inevitable occurrence of coincidences. In particular, the serious scientific studies that have been conducted into water dowsers, clairvoyants and the like have always found that such people do not have the abilities that they claim, achieving results no better than the laws of chance would suggest. To give the episode credit, it does make some attempt at balance, by having a sceptical voice interjecting at various stages, though the overall perspective is clearly one of credence towards the subject-matter. 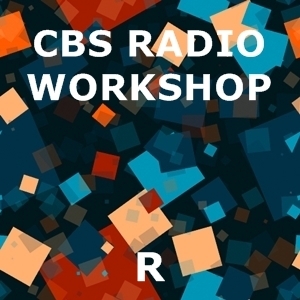 As usual with the CBS Radio Workshop, the production values are high, and some of the case studies are enjoyably presented, but I doubt that either believers or non-believers will gain a great deal from this episode. Plot synopsis: Archaeologists in the year 7956 explore the abandoned ruins of the long-dead civilization of North America, and attempt to decipher the meanings of its strange artefacts. Based on a short story, 'Digging the Weans', first published in Harper's Magazine, in November 1956; together with another story, 'A Further Report on the Weans', this was later expanded into a book, The Weans, in 1960.
Review: In the Edgar Allen Poe short story 'Mellonta Tauta', published in 1849, the author of a found manuscript purportedly offering an account of a transatlantic trip - by balloon, no less - a thousand years in the future offers a series of observations on what is (to him) long-ago history, in which he gets many details, including the spellings of notable historical figures' names, badly wrong. This episode, based on a story written a hundred years after Poe's, adopts a similar, and similarly humorous, approach to reflecting on familiar aspects of modern history by imagining how people from the distant future might misunderstand and misinterpret them. In this case, it is archaeologists exploring long-abandoned American cities who offer us their interpretations of our own times, yet their erroneous inferences shed satirical light on contemporary society - for example, according to their reading of the evidence, an Elvis Presley concert must have been a religious ceremony! A whole host of such misunderstandings (including about the significance of the Hollywood Walk of Fame and the contents of a department store) contributes to what is a sharp, and very funny, episode. As with Poe, humour is also generated from the misreading and mispronouncing of proper names, specifically, the major cities that are investigated - thus, New York becomes 'An Yok', Los Angeles becomes 'Loose Angles' and, most bizarrely, Washington becomes 'Pound-Laundry' (by reversing the syllables of its name, and interpreting 'Ton' as Pound and 'Washing' as Laundry). There are also some quite bold aspects to the story - not only in suggesting that US society will, at some point in the following centuries, completely collapse, but by making the archaeologists exploring its ruins Africans; they work for the Ethnical Museum of Antiquity in Kenya and their findings are reported by Radio Rhodesia. To some extent, the joke does wear a little thin after a while, as the plot is a touch repetitive, but overall, this is first-class satire, and a very entertaining listen. Plot synopsis: A semi-autobiographical account of Mark Twain's adventures in the Wild West of the 1860s. Based on a book of the same name first published in 1872.
Review: Presented in the form of advice for would-be screenwriters of Westerns, this adaptation of Mark Twain's memoirs of his time in the Wild West is passingly amusing, though overall, not an entirely successful episode. Narrated by Samuel Clemens (it's never mentioned that this is Mark Twain's real name), it presents a series of extended anecdotes about his journey to, and exploits in, the Nevada Territory. These are lightly humorous, though there's nothing here that is laugh-out-loud funny - I'm no Twain expert, but from the evidence on offer, this doesn't seem to be Twain at the height of his comedic powers. Still, what I found puzzling is the suggestion that these tales might function as a sort of instruction manual for modern writers of Westerns. This conceit simply doesn't work. There are none of the gunfights, stagecoach chases, bank robberies etc. that were the staple of Hollywood Westerns at the time the episode was broadcast, so what exactly did the CBS Radio Workshop imagine writers would be learning from these wry, low-key stories?